« L’option de la voie juridique ». Conflits portant sur le mariage, le divorce et les rapports sexuels en dehors du mariage dans les tribunaux coloniaux de Libreville, Gabon 1939-1959. – À l’appui de documents d’époque issus des multiples niveaux des tribunaux indigènes de Libreville (Gabon) de 1939 à 1959, cet article avance qu’il est difficile d’identifier ce que constituaient le mariage et le droit sur les femmes à cette période de changement socio-économique. Après la Seconde Guerre mondiale, les Français se sont efforcés de mettre en place un système judiciaire indigène mettant l’accent alternativement sur les médiateurs africains et français pour inculquer les principes d’une loi coutumière sur le mariage. En revanche, dans les villages et les quartiers de la région de Libreville, des Anciens jouaient le rôle d’arbitres dans des tribunaux qui n’étaient pas reconnus par l’État colonial. Gabonais et Gabonaises – maris et femmes, amants, pères, oncles, frères et belle-famille – s’efforçaient de trouver toutes sortes de terrains juridiques pour arbitrer les conflits en matière de mariage, de divorce, d’adultère et de garde parentale. Ces tribunaux indigènes offraient aux hommes et aux femmes un espace de manœuvre dans la négociation de leur statut conjugal. This article analyzes extant records of the multi-layered native court system from 1939 to 1959 in Libreville, Gabon to argue that what constituded marriage and rights-in-wives was fluid in this era of socio-economic change. In the post-World War II era, the French struggled to establish a native court system, alternatively emphazing African and French arbitrators, to enforce rigid ideas of customary marriage law. Additionally, in villages and neighborhoods in the Libreville region, senior men presided over courts not officially recognized by the colonial Qtate. Gabonese men and women–husbands, wives, lovers, fathers, uncles, brothers, and in-laws–sought out varied judicial arenas to negotiate conflict over marriage, divorce, adultery, and child custody. Rather than enforcing rigid legal judgements of what constituted legitimate marriage, judgements rendered by these varied courts provided maneuverability for women and men to negotiate marital status. 1In April of 1956, a plaintiff named Bernard Koula presented what should have been a rather straightforward case for a conciliation hearing before native assessors of the first-degree court for the city of Libreville1. Like hundreds of other men in the post-World War II period, Koula solicited the native court system to affirm his rights over his wife’s person, sexual access, and reproductive capacities according to “customary law”. Koula brought the charge of adultery against a man named Michel Ondo. Koula accused Ondo of having had sexual relations with his wife, Aguès Moutombi, and further testified that she had been living with Ondo for the past two years. Moutombi had rebuffed Koula’s efforts to compel her to reside in their conjugal home. Accepting that there was no possibility of his wife’s return, Koula demanded that Ondo pay him a fine for the adultery and reimburse him the bridewealth that he had disbursed to Moutombi’s mother. 2Ondo admitted to having had sexual relations with Moutombi, but in a surprising turn he countered that she and Koula were not legitimately married. Ondo insisted that Moutombi was still an unmarried woman since she had never left the home of her natal family to live with Koula. Ondo refused to pay an adultery fee and reimburse bridewealth on the grounds that Koula was not her husband and therefore did not control sexual access to her. Moutombi testified that though Ondo had remitted bridewealth to her family, she had never consented to marry Koula and did not consider him her husband. She argued that her family accepted Ondo’s bridewealth against her will and concurred that she had never left her natal home to live in a residence provided by Koula. With the statement that she “denies that she belongs to either Koula or Ondo”, Moutombi contended that neither her lover nor the man who claimed to be her husband had rights over her person2. 3What was at stake in this case was the question of what constituted a legitimate marriage–was a woman’s consent to marry necessary or could her family and a suitor enter into a marriage agreement against her will? The court dismissed Koula’s claim for an adultery payment on the grounds that he and Moutombi were not legitimately married. Koula had remitted bridewealth, but Moutombi never co-habitated with Koula. In dismissing Koula’s suit, the native assessors suggested that the consecration of marriage was dependent upon the consent of the bride in question, not on the decision of her family to accept bridewealth from a suitor. The twists, turns, and outcomes in the case involving Koula, Moutombi, and Ondo demonstrate that far from maintaining husbands’ control over their wives, native and colonial courts in the post-World War II era were arenas in which men and women debated, drew, and redrew conjugal boundaries. While most of the Estuary region’s inhabitants did settle conjugal conflict outside of court, within extended kin networks, many of the Estuary’s inhabitants also solicited courts to settle their affairs3. 4This article analyzes surviving court registers for Libreville and the rural areas of the Estuary region from 1939 to 1959. The varied changes in the court system in the post-wwii period reflected the multi-layered, shifting, and complex nature of power, custom and law. At stake was political authority, control over economic resources, and the establishment of moral and social order in a period of socio-economic change, social dislocation, and migration. In native and colonial courts husbands, wives, and lovers struggled to define what constituted marriage, the rights of men and women in conjugal relations and the conditions and terms in which conjugal ties could be severed. Tension points in court hearings arose around questions of the payment and reimbursement of bridewealth, wife kidnapping, divorce, and adultery. This article contributes to the revisionist literature of colonial courts, customary law, and conjugal practice to argue that the very process of defining customary law in post-World War II Gabon was marked by simultaneous moments of rigidity and ambiguity, thereby creating spaces for African men and women to propose varied visions of conjugal and sexual relations4. 5As colonial administrators, missionaries, and senior African men offered varied policies to facilitate the establishment and maintenance of African marriages, the process of reforming the native court system to enforce these directives was critical. As the momentum for the expansion of African self-governance in other parts of Africa grew, colonial officials and African men in Gabon struggled over who had authority to determine and enforce customary law. In the decades after World War II, alliances between senior Gabonese men and the colonial state were never assured, yet remained tenuous and at times non-existent. There was no uniform group that could be referred to as “senior African men” in twentieth century colonial Gabon. Chiefs and mission-educated colonial civil servants disagreed over competing definitions of “custom” and how to incorporate “customary law” with Christian and French practices. Who had the right to preside over courts and decide conjugal status? What bodies of custom and/or law where arbitrators to look towards in making their decisions? At the heart of contentions between chiefs and local colonial officials was the reoccurring question of the degree to which colonial governance was to include direct or indirect rule. 6Félix Éboué connected questions over the reform of customary law and conjugal practice to the reform of colonial governance in Native Social Policy. Éboué (1942: 20-21) argued that native judges, not Frenchmen, should be formally invested with the authority to preside over first degree courts “in allowing questions of state of persons–marriage, divorce, adultery, the conferring of natural children, inheritance–to be settled in the first instance by native judges alone”. Éboué argued that French administrators’ desire to grant African women more freedom than that allowed in native societies had gone too far. French magistrates granted African women’s requests for divorce too frequently and women committed adultery with little fear of impunity. The period of tutelage in which Frenchmen guided African assessors in administering the laws of “civilization” had come to an end. Native judges, he argued, were best suited to determine which combination customary and French law would preserve marriages5. 7Senior administrators appointed after Éboué were less keen to invest African judges with such formal authority in the colonial legal system, yet did concede some measure of formal African participation in directly administering native justice. In July 1944, senior French administrators in Brazzaville decided appointed a new layer to colonial courts in French Equatorial Africa (fea). Customary courts, also known as courts of common law, were to be staffed exclusively by Africans. The judges would usually be customary chiefs and they were to preside over civil and commercial disputes between Africans according to customary law6. 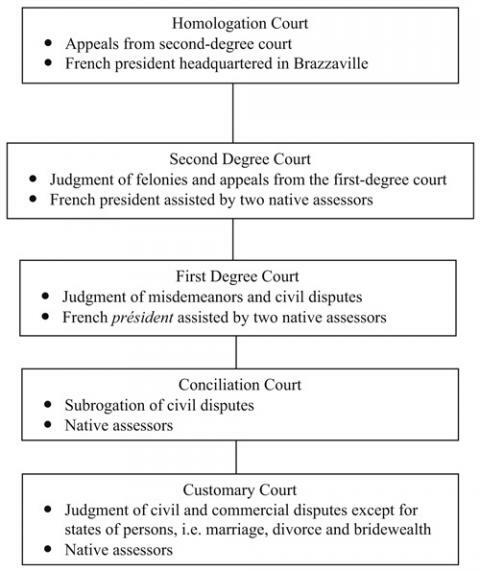 8However, customary courts were charged with settling non-criminal litigation between African populations except cases relating to: “the state of persons, the family, child custody, marriage and divorce” which would remain under the jurisdiction of first degree courts presided over by a French president assisted by native assessors7. In a circular to individual governors, Governor General Bayardelle urged that first degree courts administered by French judges assume the role as “guarantor and guardian of the institution of marriage” by ruling for divorces in limited circumstances8. According to the decrees drawn by French colonial representatives, in the post-World War II era, the multi-layered colonial legal system was to be an arena in which the stability of African marriages was to be maintained. The following diagram illustrates the colonial legal system as it was officially mapped out from 1939 to 1955. 9In practice, the native court system was a chaotic network of multiple sites of dispute resolution–chiefs continued to preside over “courts” that were not officially sanctioned by the colonial state and rendered judgments that demarcated conjugal boundaries. In a 1948 letter to the governors of fea colonies, Governor-General Luizet signaled that laws establishing the new legal system were far from being followed9. Luizet pointed out that in many regions, in addition to first and second degree courts, unsanctioned native courts were operating on an ad hoc basis without formal dates for hearings being established or a state appointed native assessor or président present. Furthermore, no records were maintained of these proceedings; they were only oral and not transcribed in registers. What was more troublesome, Governor-General Luizet pointed out, was that these hearings had strayed from their intended purpose of reconciliation and in fact rendered judgments in areas that exceeded their mandate. Firmly stating that this state of affairs could not continue, the governor-general instructed colonial governors to ensure that the new customary courts be established, that each of these courts were to maintain a register of litigants, the nature of the conflict, the agreement reached upon, and if an appeal was sought. The Governor-General ended the letter by reinforcing that customary courts were to defer to first and second degree courts all cases dealing with marriage, divorce, etc. and that each district head was to complete monthly inspections of the courts and send a report to the attorney general and the political affairs office10. 10Although first and second degree courts were to preside over all cases of divorce, in reality these courts rarely settled such matters. The Estuary’s inhabitants continued to look to chiefs to arbitrate conflicts over marriage, divorce, and bridewealth and chiefs were not content to let this power erode. In a 1946 circular to governors of individual aef colonies, Governor-General Bayardelle acknowledged that first degree courts presided over only a small number of divorce cases, as the region’s inhabitants preferred to settle disagreements “according to custom” before chiefs or other elder men11. “Such a state of affairs can have serious political consequences. For the good reputation of the administration, in order to maintain our prestige before those we administrate, it is essential that the sanctions that we administer, whatever they may be, whether we declare them directly or by the intervention of notables, are strictly applied. It is also our duty and in our interest to support the action of our conciliator-judges, in order to give them authority over the populations. In addition, I urge you to follow the settling of palavers very closely and to watch over so that decisions reached in arbitration are executed. If they are not followed, arraign those who have defaulted before your civil and commercial first degree court”13. 12For local officials in Gabon, chiefs and native assessors were the direct mouthpiece through which they governed. Local officials did not want to be encumbered by the frequent instances of household disagreements, yet wanted the decisions taken by appointed native authorities to be viewed by populations as the official judgment of the colonial state. Although the colonial state articulated a legal system based on direct rule in which French judges would determine the status of persons, on the ground, chiefs and the populations they represented redrew conjugal boundaries through indirect rule. “In the settlement of legal disputes, palavers by chiefs are often annulled, either at city hall, or at the subdivision or judged directly by the native courts of first and second degree without preliminary discussion with chiefs in question, etc. Those who belong to the Administrative Authority should reinforce the authority of chiefs and not destroy or erode it, even less to diminish it”15. 14Given the existence of multiple legal arenas, Libreville’s inhabitants could strategize as to which of the varied courts would be more likely to enforce their conceptions of their conjugal status. Courts were spaces in which competing versions of customary law could articulated, interpreted, or thrown out. 15Husbands went to court seeking the native authorities to grant them control over their wives’ person, sexuality, reproductive capacities, and labor, yet customary courts often granted women’s requests for the dissolution of their marriages. The only surviving register for a customary court in the archives is that of the third district of the subdivision of Libreville. From November 1950 through May 1955, the customary court heard and rendered judgments in 181 complaints16. Of the total number of cases over this five year period, 107 cases or fifty-nine percent concerned questions of marriage, divorce, and bridewealth. These were precisely the types of cases over which they had no official jurisdiction. Almost all the litigants were Fang, reflecting that ninety five percent of the subdivision’s inhabitants were of this ethnicity. The court register identifies the names, ages, and villages of residence of plaintiffs and defendants and a brief one-paragraph summary of the case. This summary includes the plaintiff’s charge, the defendant’ response, if s/he contests the plaintiff’s claims, and the decision taken by the tribunal. This cursory summary of proceedings might include one or two sentences by the wife or woman in question. Some of the cases provide some of the context in which disputes were taking place, while other summaries detail only the plaintiff’s complaint and the judges’ decision. 16The following chart summarizes the categories of cases brought before the court during this five-year period. Some of cases filed before the courts involved multiple complaints, thereby resulting in a total of 113 complaints in 107 court cases17. 18before the court soliciting a divorce. Only four percent of marriage cases from 1950-1955 involved a husband’s petition for a divorce18. Men brought complaints before the customary court primarily seeking the return of their wives who were taking refuge with kin or lovers. Nearly sixty percent of the cases presented before the court were disputes between men claiming rights to a given woman through accusations of wife kidnapping, adultery and/or claims to levirate. Husbands also sought monetary compensation– payment from wives’ lovers as restitution for unauthorized sexual access, payment from women’s kin for accepting bridewealth from a rival suitor, and the reimbursement of bridewealth in occurrences in which a marriage did not take place or parties had agreed to dissolution. The summaries of bridewealth cases do not provide enough detail to ascertain the terms of the debates. These summaries merely state the amount for which the plaintiff was suing, followed by the judge’s decision to award or deny the amount19. Thus, the presentation of bridewealth disputes in particular, as well as the other categories presents the impression that women and rights over their persons were objects to be bartered over by groups of men. Husbands particularly sought to control their wives’ sexuality by prosecuting women’s lovers. 19Choruses of chiefs, elite African men, missionaries, and colonial officials advocating the reform of conjugal law and practice maintained agreement on adultery by women as the most blatant threat to the stability of African marriages. However, they proposed distinct strategies to stem the tide. Fang custom defined adultery as an act of theft against a woman’s husband. Mba’s essay on customary law summarizes the common practice that “the Adultery of a married woman is severely punished with beatings and corporal punishment, etc. because it is considered theft and the accomplice pays a fine to wronged husband” (Mba 1938). As the wronged party, the husband had the right to seek restitution not only from his wife, but her lover. Husbands punished adulterous wives with beatings, temporary or permanent repudiation, and increased surveillance. Before a public forum, husbands also sought restitution from their wives’ lovers. The Pahouin Congress set the fines to be assessed for a first time offender as 500 francs and for the recidivist as 1,000 francs. 20Colonial and missionary representatives argued that the practice of husbands receiving monetary compensation from their wives’ lovers for adultery amounted to sanctioning prostitution20. This was especially acute in villages near timber camps in which husbands knew that their wives were engaging in sexual relations with other men, yet permitted it to happen knowing that they could receive money if they brought the lover before a court presided over by a chief. Even if a pregnancy did result from the extra-marital relationship, the child would go to the husband since having paid bridewealth granted him rights over any children his wife bore. The 1945 Penal Code for French Equatorial Africa made adultery a criminal offence under which both the wife and lover could be fined and/or imprisoned21. Yet, few husbands sought the criminal prosecution of their wives or their lovers for adultery22. In 1942, under the urging of the governor, a gathering of missionaries and Estuary village chiefs proposed an additional document codifying Fang conjugal customary law. The conveners decreed, “No payment can be demanded for adultery. Those who traffic in this way will be severely punished”23 In spite of these directives, monetary compensation continued to be the avenue through which husbands sought to bolster their exclusive rights to determine sexual access to their wives. 21For husbands presenting complaints of adultery, the courtroom represented an arena in which they could restore their honor by having their wives’ lovers publicly admit to the affair and condemned to remit just compensation. Wives did not play a major role in the proceedings of adultery cases. The legal dispute was between her husband and her lover who had sexual relations without authorization from and compensation to the husband24. The summaries of adultery cases reveal little by way of narrative detail, witness testimonies, and judges’ deliberations in coming to a decision. Case summaries usually consisted of the plaintiff’s statement that the defendant had committed “adultery” or “sexual relations” with his wife, the amount requested by the plaintiff, followed by subsequent admittance to the affair if the defendant previously denied it, and the judges’ award of monetary compensation25. 22Compensation from the lover to the husband confirmed that husbands who had entered into a legitimate marriage with their wives “owned” their wives’ bodies and control over sexual access to her. Summaries of adultery cases do not provide details into how husbands proved themselves to be the legitimate spouse and what criteria judges used to determine if a relationship was a formal marriage. However, in all of the thirty adultery cases heard from November 1950 through October 1954, the customary court ruled in favor of the husband and ordered the lover to pay a fine directly to the husband26. As outlined by the case of Nzé Meyo versus Bekale Benguema, the order to pay an adultery fee was punishment for “having admitted to having sexual relations with a woman who did not belong to you”27. In between 1950 and 1955 fines varied from as low as 500 francs to higher judgments of 5,000 francs. Lovers who had pursued an extra-marital affair with a woman on several occasions or had sexual relations with a woman in the conjugal home were assessed a hefty fine of 2,500 to 5,000 francs28. The court also levied the higher fees of 5,000 francs on lovers who attempted to convince the wife to divorce her current husband and marry him29. Court transcribers used the phrases “to turn her head” or “give her a bad head” to describe to efforts by lovers to convince wives to transform episodic extra marital relations into a legitimate marriage30. The language used in the adjudication of adultery suits presents women as passive vessels being acted upon, thereby erasing the factor that women were usually complicit in seeking out and maintaining extra marital sexual relationships. 23Although husbands were identified as plaintiffs in nearly all of the cases before customary courts, what brought men to court was that their wives, or women they claimed as their wives, initiated the conjugal crisis. Women had either committed adultery, run away with and sometimes married other men, had abandoned their conjugal home to return to their kin and ask for a divorce, or, as widows, refused to marry their deceased husband’s heir. In his essay on customary law Léon Mba stated, “the Fang woman had no legal power” (Mba 1938: 75). This was not so categorical in the post-War era. Though women did not directly present themselves before customary courts, they did so through the intermediary of male kin or a lover. While the legal language and forum of adjudicating domestic conflict, did not formally recognize women as active agents in determining conjugal status, the strategies made by women in seeking out other men facilitated their desired outcome of divorce. 24Accounts of Fang customary law after World War II acknowledged that Fang custom allowed divorce, yet sought to restrict the parameters in which dissolution could take place. Since nearly all requests for divorce emanated from women, senior African men and colonial representatives codifying customary law sought to limit the grounds on which women could seek a divorce. Mba’s essay stated that a Fang woman, “assisted by he who had received bridewealth, is authorized by custom to ask for a divorce against her husband” in specific instances 31. A woman could ask for a divorce if her husband lacked respect, refused to aid, or caused bodily harm to her kin, inflicted grave bodily harm on her, and if he committed adultery with a woman in her family. The essay pointedly stated that a woman could not ask for a divorce in case of her husband’s sterility. The 1942 Project to Regulate Marriage among Fang Natives sought to limit “frivolous” demands for divorce by wives married according to custom, yet to allow leeway for women who converted to Christianity the right to divorce husbands who had not also converted32. Women in customary marriages could only solicit a divorce if they fit into two criteria: they were the second or subsequent wife in a polygynous marriage or were subject to cruelty and severe ill-treatment in their marriages33. Relatives or other third parties who encouraged women’s requests for divorce and women who deserted their husbands outside of the approved parameters were subject to “severe punishment”. The native Penal Code made “abandonment of the conjugal domicile by wife without probable cause” a crime that could result in a prison term34. Although revisions of customary law and newly proposed criminal laws sought to limit the parameters within which a woman could leave her husband, women continued to access several avenues and the customary court often ruled for a judgment of divorce. 25Husbands sought out customary courts to counterbalance the influence yielded by their wives’ kin in determining whether a marriage would be maintained or ruptured and to ensure that they received reimbursement of their bridewealth if women’s relatives retained their wives. The primary locale in which most women unhappy in their marriage took refuge was with their natal families. Husbands sued their in-laws in customary court on grounds that they were illegally retaining their wife. They argued that, as legitimate husbands, they maintained rights over their wives’ person. Though some women went away without the authorization of their husbands, many women sojourned with their husband’s authorization to visit or attend to a sick relation or receive care themselves if they were ill35. Wives refused to return to their conjugal home, sometimes requesting that a specific grievance be addressed or requesting an outright divorce. The brief transcripts of the cases rarely detail why the wife is seeking a divorce. A few cases do indicate alleged motives such as child marriage, while other women charged their husbands’ relatives with witchcraft, and others claimed excessive physical abuse or lack of respect for their natal families36. The summary of court proceedings do not record husbands’ responses to allegations levied by their wives nor the grounds upon which chiefs made their decisions. However, the overwhelming number of cases in which chiefs ruled for divorce indicates that senior men were not want to force women whose natal custodians supported their claims for divorce to return to conjugal residences. 26Native judges allowed a divorce in seventy-two percent of cases in which a husband sued his wife’s kin for her abandonment37. Chiefs were not willing to allow women to re-enter society as unmarried women completely bereft of social control. While these rulings do indicate some measure of allowing women to determine their conjugal status, rulings for divorce also reinforced some measure of patriarchal and familial control in that rights in persons over women were transferred only with the consent of the male natal custodian38. However, all rulings of divorce also involved the judgment that the wife’s family reimburse the husband an agreed upon amount of bridewealth. 27Given the large number of bridewealth cases that also appeared before the court, women’s kin often defaulted on the reimbursements and former husbands often had to seek the intervention of the court in order to receive payment. The proceedings involving Meyo Mba, his wife Assengone Meyo, and her brother Mefague Mendong in February 1952 are representative of many of the cases involving abandonment. As was customary when ones’ wife went to her family of origin to air conjugal grievances, Emane Bekale pursued Assengone Meyo in an effort to reconcile39. After she refused to return with him and asked for a divorce, he sued her brother Mba Nkile in court. Yet, the court allowed the divorce, along with the reimbursement of Emane Bekale’s 25,000 francs in bridewealth because Mba Nkile “consented to the dissolution of his sister’s marriage”. 28It was cooperation of male kin who had negotiated and accepted bridewealth from her current husband–her father, brothers, or uncles–that most determined whether or not a woman’s claims for divorce would be successful if contested by her husband in customary court. The customary court ruled in favor of husbands’ suits and ordered the wife to return to the marital home only in cases in which the wife or her male relative conceded to reconciliation. Wives appearing before the court rarely indicated a preference for remaining in their marriages–the only such suit was that of Ekobeang Edang who indicated in a 1951 hearing that, “in spite of everything that has happened, she does not want to leave her husband, her hope is still with him”40. In the presence of the court Edang’s brother, who had been named as the defendant, reaccepted bridewealth from his brother-in-law Esso-mba and Edang returned to the conjugal residence. African judges did not concede to women’s wishes for divorce if her natal custodian agreed to allow her to return to her husband41. 29Fathers or brothers often retained custody of women only as a means to compel their son or brother-in-law to complete bridewealth payments42. Such was the case of Essema Essono who sued his brother-in-law Ndong Obiangue on the grounds that, “I married his sister named Ntsam who has abandoned the conjugal domicile for several months without my authorization. When I was absent from my house and left the key with my wife, my brother-in-law stole 4,000 francs from me”43. Court assessors then asked Nstam Ondo if she wanted to return to her husband to which she replied, “no, since my husband did not allow me to stay peacefully at his house and he has let me enter by the option of the judicial path, I cannot return in this case”. Ntsam chastised her husband and his failure to remit bridewealth in a timely manner as precipitating the events that brought them before the court. The judges then asked Nstam Ondo’s brother if he consented to his sister’s wish for the dissolution of the marriage. Ndong Obiangue responded that he did not consent to her divorce, merely sought the 5,000 francs of bridewealth that Essama Essono had agreed to pay. The court ordered the wife to return to her husband and that he remit the remaining bridewealth. 30The court, however, was not prepared to uniformly assert husbands’ rights over their wives if husbands had failed to pay regular installments of the promised bridewealth44. The court held the remittance of bridewealth as the crucial factor that made a marriage legitimate and gave a husband rights over his wife’s person and the reimbursement of bridewealth as the process formalizing the dissolution of a marriage. Yet what about disputes in which two men had paid or were prepared to make bridewealth payments and each claimed to be legitimately married to the same woman? 31Another avenue for women unhappy with their marriages to negotiate a way out was to find a lover who would reimburse her first husband’s bridewealth. As with charges of adultery, abandonment, and bridewealth, men soliciting the intervention of the court in struggles over levirate and wife-kidnapping did not name their wives as defendants, but rather their wives’ lovers or male relatives. The goal was not to punish his wife, but to establish that her suitor or male relative had made illegitimate claims over his wife. A plaintiff bringing the complaint of wife kidnapping or a dispute over levirate before the customary court sought to establish that he was the legal husband of the woman in question. Such plaintiffs sought the woman’s return and compensation from the illegitimate suitor for having robbed him of her labor and sexual access. In many instances, the wife’s family had even accepted bridewealth from her lover without having yet reimbursed her first husband, thereby incurring the thorny question of who was her legitimate husband45. In cases in which the wife had returned to her husband’s home, he demanded only monetary compensation from her lover for having temporarily absconded with his wife. In disputes over levirate the plaintiff claimed to be the legitimate husband of the widow since he was the heir of her deceased husband. The defendant countered either that he was the rightful heir or that the widow be granted a divorce from her defunct husband’s family and marry him. Men claiming rights to levirate also often charged the defendant with wife kidnapping if the woman in question had left the residence of her deceased husband to live with the defendant. 32Charges of wife kidnapping were a misnomer since women were usually complicit in absconding with their lovers. At the heart of complaints involving wife kidnapping and levirate was the question of whether or not women could chose their own husbands. Native assessors Andre Mbolo and Bernard Mba, assisting in a 1941 criminal case in which a man was charged with kidnapping a widow, stated “Fang custom commands the reimbursement of bridewealth if the woman had voluntarily followed her ravisher”46. In seventy-five percent of kidnapping cases in which the wife insisted on remaining with her new husband, the court ruled for divorce between the wife and her first husband, thereby legitimizing the woman’s preference for the second marriage47. Judges ruling for divorce sought to ensure that the wife in question would be transferred into a conjugal arrangement that garnered less discord. Husbands claimed that their remittance of bridewealth to the bride’s family meant that their marriage was binding. However, the court’s ruling for divorce signified that the exchange of bridewealth was not a binding legal contract. It could be broken if the woman in question insisted on a divorce and had aligned herself with a suitor able to reimburse her first husband’s bridewealth. 33Although the court dismissed the claims of first husbands to their wives in many of the suits of wife kidnapping, native judges did not declare that rival men were the legal husbands without some measure of impunity. In forty-seven percent of cases in which the court declared a divorce between the wife and her first husband, the court also ordered the defendant to pay the husband a fine ranging from 2,500 to 5,000 francs48. While the courts affirmed that marriage contracts could be broken if a woman abandoned her conjugal home for that of her lover, chiefs also sought to temper abandonment by imposing heavy financial penalties on a man who settled upon a married woman. 34The plaintiffs and defendants who are recorded in the case summaries were usually men. Women, sometimes anonymous and other times identified, and their actions and desires seep through the transcripts of the court cases as driving the outcome of the question: who was the legal husband? This is clearest in complaints of wife kidnapping that also included disagreements over levirate49. Customary laws stated that a widow was to marry a member of her deceased husband’s family chosen by a family council. Reflecting the turn towards allowing widows some measure of self-determination, the Mandel Decree of 1939 permitted a widow to marry outside of her deceased husband’s family without needing to reimburse bridewealth. The published proceedings of the Mitzic Pahouin Congress amended the Mandel Decree to qualify that she could marry out of her husband’s family if she reimbursed them the bridewealth. 35In seventy-five percent of cases in which men claimed the right of levirate, the court allowed the widow to divorce from the family of her deceased husband and marry the man of her choice50. The caveat was that her new husband reimburse the family of her deceased husband his original bridewealth. The case of Evoung Nzogo, the heir of the deceased, versus Mbembang Minko, the lover of a widow, illustrates the typical manner with which the court decided the question of who was legally her husband: “The widow in question categorically refuses to marry into the family of her deceased husband”51. Following this indication of will from the widow, the customary court settled the suit by ordering the lover to reimburse the husband’s family of the original bridewealth payment, thereby paving the way the widow to enter into a new marriage. 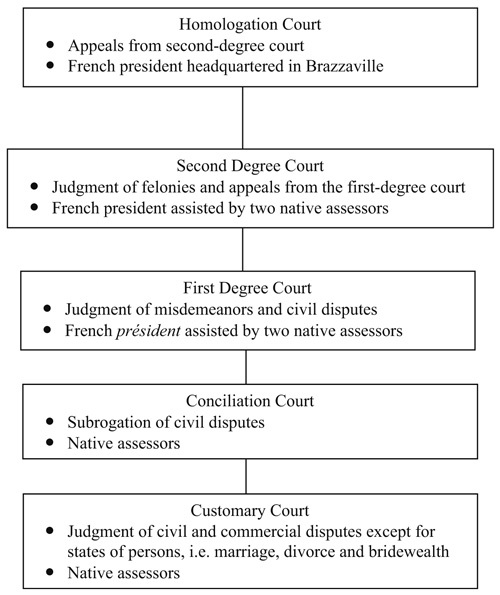 While a customary court presided over by native magistrates was the judicial path that many of the region’s inhabitants pursued, others chose to present domestic conflict before first and second degree courts presided over by French intermediaries who also purported to judge according to customary law. 36It is not possible to know just how many cases regarding marriage made their way before French judges in Estuary region after World War II. No extant registers of the first degree court for the Libreville region have survived between 1939 and 1959. Yet, we know that some litigating parties did indeed seek French intermediaries to settle domestic disputes because they subsequently appealed judgments made in the first degree court before the second degree court. A full run of records from the second degree court for the Estuary region survives from 1939 to 1966, with the exception of 1941-194452. Few of the recorded cases provide comprehensive transcripts of witness testimony, deliberations considered by the judge and assessors, and an explanation for their decisions. Most records merely include the name of plaintiffs and defendants, the original decision decided upon by the lower court, and the decision decided upon by the second degree court. Nevertheless, these sources provide a valuable portrait of the multiple terrains in which conjugal law and practice were determined. 37Nearly all litigants bringing cases before the second degree court lived within the city limits and, as such, the parties before the court reflected the ethnic diversity of Libreville. The majority of plaintiffs and defendants were Fang, but also included Mpongwé, Gabonese of other ethnicities, as well as Africans from other francophone colonies. Litigants were part of the emerging middle class of Libreville since the men were mainly employed in wage labor by the colonial state or private European enterprises. Their professions ranged from domestic workers–gardeners, cooks, and drivers–to masons, carpenters, clerks, teachers, and typists. Some were self-employed as cultivators, fishermen, bakers, and foresters. Most women were listed as “without profession”, but many were maids and one was a midwife. In between 1939 and 1960, the second degree court presided over thirty four appeals of lower court decisions of conjugal disputes. The following chart outlines the nature of these disputes. 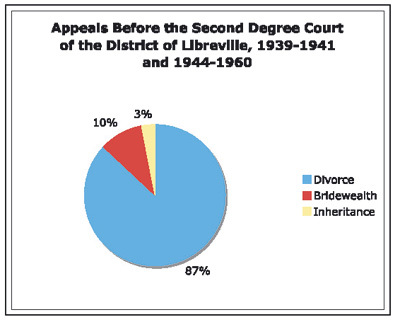 38Differences over the terms of the dissolution or contracting of marriage dominated the court’s roster–either struggles between men and women and women’s families over whether or not the money that men had remitted constituted bridewealth or husbands, wives, in-laws, and lovers contesting the terms of a divorce. In contrast to cases presented before the customary court in which women appeared in court represented by natal male custodians, women represented themselves directly before second degree courts. Women initiated twenty-five percent of the appeals. Since many of the city’s inhabitants originated from regions other than Libreville, many litigants could not or chose not to access kin networks to present and mediate their disagreements. Many husbands and wives directly confronted each other in court, without the intermediary of senior family members, to individually determine and renegotiate their own conjugal status. 39In an era of socio-economic uncertainty and escalating marriage costs, it was never clear when a prospective groom had completed a sufficient amount of payments that formalized a legitimate marriage. This question was foundational to settling the terms of the dissolution of marriages, primarily child custody. As demonstrated in the opening anecdote to this article, the question of what constituted a marriage could be answered along a shifting continuum of goods and money exchanged, intent, and mobility. Many of Libreville’s male and female residents entered into serial concubinage rather than marriage and it was often challenging to distinguish between the two. Mpongwé customary law delineated that a man and woman were married, not at the point in which the groom’s family transferred bridewealth to the bride’s, but at a preceding moment in which the two families publicly met and agreed upon the marriage. As such, the payment of bridewealth alone did not legitimatize a marriage and therefore a couple could agree to divorce without the reimbursement of bridewealth53. 40For Fang customary law, the definition of what constituted a legitimate marriage was highly contested. A 1939 first degree court proceeding cited a legitimate marriage in Fang custom as constituting two elements–the completion of bridewealth and the cohabitation of the wife and husband in the husband’s residence or in a residence that he had built for her54. However, Léon Mba’s study emphasized that, “the payment of bridewealth to a woman’s family assures the definitive possession of the woman. Custom permits the payment of bridewealth in several payments” (Mba 1938: 73-74). Once two families had agreed upon the engagement of a man and woman, known as dzanghan, the fiancé began to remit increments of gifts and services to his in-laws that contributed towards bridewealth. Within Mba’s definition when parties divorced, the reimbursement of bridewealth was to include any gifts the husband had given to his wife’s family. Kitchen utensils and household objects that a husband had given to his wife were deemed to be her personal property. The requirement of reimbursing bridewealth and gifts was to temper the dissolution of marriages, given that a divorce was not final until the entire amount had been reimbursed to the husband. However, in 1942, Governor-General Laurentinie stated that a husband’s supplemental obligations to his in-laws were separate from bridewealth. The supplements, he argued, “which are greedily demanded from the husband are gifts, and sometimes represent penalties”55. 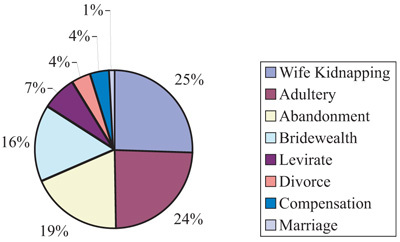 As demonstrated in these varied interpretations of bridewealth, the line between what constituted bridewealth that formalized a marriage, versus gifts that reflected the efforts of a suitor to gain the favor of his prospective bride and in-laws, versus compensation of a lover to his concubine for the domestic and sexual services she rendered was often blurred. It was this moving boundary that often set the parameters within which French judges determined whether a relationship was a legitimate marriage, an engagement, or concubinage. 41The second degree court sought to establish the example that women and their families who committed bridewealth fraud–entering into a marriage contract by accepting cash and goods from a suitor and then keeping the money and the bride–would not be tolerated. In 1960, Memvie Memba was ordered by the first degree court to reimburse his daughter’s suitor Joseph Amvame the 13,335 francs he had accepted as bridewealth plus a penalty of 10,000 francs as restitution for the fraud56. Memba appealed the case, but the second degree court confirmed the lower court’s decision and increased the fine to 12,500 francs, the fine almost equaling the bridewealth amount. 42Reflecting the colonial alarm that escalating bridewealth and attempts by women’s families to extract money and goods contributed to the instability of African families, administrators presiding over the secondary court inclined towards regarding the remittance of goods or cash to a woman and her family as constituting bridewealth, and therefore a legitimate marriage or the intent to marry. Determining whether a relationship was concubinage, an engagement, or a legitimate marriage was the first step in settling the domestic conflicts presented before the court. The 1958 case of Augustin Mougangue versus Pauline Babina, his former lover, involved such a quandary57. Mougangue appealed the decision of the first degree court that negated his contention that he and Babina had been legitimately married and the gifts and cash he had given to her family constituted bridewealth. The first degree court denied his claim to reimbursement of 35,975 francs stating that she was his concubine, not his wife. Concubinage did not include an agreement to marry, thus any gifts given to a woman or her family by her lover was compensation for the sexual and domestic services she rendered. She did not have to reimburse him in the case of dissolution of the relationship. However, the second degree court reversed this decision, determining that Mougangue had given 11,700 francs to Babina’s family and that this constituted bridewealth58. The court pronounced a divorce between the two and ordered Babina to reimburse Mougangue his bridewealth consisting of 10,000 francs, a thermos, and household objects59. In contrast, formal engagement or marriage was a contract in which rights in persons over the woman in question were to be transferred to her husband, and therefore she owed him reimbursement of bridewealth to rectify his loss of her person and progeny should the relationship be dissolved. 43Disagreements over monetary compensation propelled both husbands and wives to appeal divorce judgments made by the first degree court. Like the customary court, the second degree court granted divorces in cases in which women had lovers who could reimburse her husband’s bridewealth, yet also sought to censure men who entered into a marriage by dissolving one which already existed60. Women, their lovers, or family members appealed decisions on the grounds that bridewealth amounts awarded to former husbands were deliberately inflated and they contested additional fines assessed for adultery or abandonment. Husbands appealed decisions on the ground that bridewealth amounts were higher than what the court had determined or to ask for additional fines. Such was the case of Jean-Francois Bekale who appealed the decision by the first degree court that both he and his wife Essone Ebone were at fault in the divorce and for Ebone to reimburse her husband 5,000 francs as bridewealth61. The second degree court took a more drastic course, augmenting the bridewealth to be reimbursed to 7,500 and ordering Ebone to pay a fee of 13,000 francs to Bekale for adultery. In cases in which the dissolution of the marriage was due to adultery or abandonment by the wife, the first degree court often assessed the lover or her family a fine in addition to the reimbursement of bridewealth. The second degree court sought to impose further impunity upon guilty parties and augmented these fines when deciding upon appeals62. However, disagreements over bridewealth amounts were not simply about monetary compensation, but over the rights in and of persons that the remuneration of bridewealth entailed. Even more so than rights of husbands over wives, disagreements over bridewealth and divorce centered around struggles over rights in children. 44The most contentious aspect of settling a divorce remained that of child custody. Men and women alike identified having children as of significant importance, for both affective and pragmatic reasons. In theory, codified accounts of customary law rendered the matter of child custody after the dissolution of a relationship cut and dry. In a 1948 second degree court hearing involving a man and a woman claiming custody of a child, the judge and assessors cited Mba’s “Coutumier Fang” as their guidebook63. In deciding upon disputes over children, Mba quoted the Fang proverb, “Mone asse mona mbiè, mone ane mona biki” (a child does not belong to whomever is the biological father, but to whomever gave the bridewealth). This proverb established that a man who paid or had begun to pay bridewealth towards a particular woman established rights not only over her person, but over her progeny. For the Mpongwé, in order to exercise paternal rights over a child, a man was required to have paid the entire agreed-upon bridewealth (Augagneur 1923). Thus, a woman who divorced could not take her children with her since her former husband retained physical and legal custody. On the flip side of this proverb, a man who had not remitted bridewealth had no rights to his child, though he was the biological father64. Any children born out of relationships that had not been legitimated with the payment of bridewealth remained in the custody of the woman’s family. This tenet held true, not only among the Fang, but other Gabonese ethnicities as well. In patrilineal societies, a woman’s father would retain custodial authority of her child, while a woman’s uncle would do so in a matrilineal society. Yet, as argued in this article, the idea of what constituted bridewealth, and marriage itself, was continually in flux, thereby providing room for maneuverability in determining child custody. 45Some women struggling to keep custody of their children after the dissolution of a marriage challenged the very custom that child custody was to be based on the transfer of bridewealth. Such was the case of Eyang Emane who appealed a divorce ruling with her husband Philippe Mouloungui in which the first degree court awarded him “all the rights associated with paternal custody”65. Emane proposed a new formulation of parental rights based on biology. She argued that Mouloungui was not the biological father and her indisputable status as the mother of the child entitled her to legal custody. Emane asserted, “I ask the court to keep custody of the child. I was already pregnant by someone else when I married Mouloungui. The child belongs to me”. However, the second degree court confirmed the lower court’s decision to grant custody to Mouloungui, affirming the tenet that custody of a child born in the instance of marriage would go to the man who was paying the bridewealth. 46Men and women struggling for custody of children bolstered the legitimacy of their appeal based on the question of whether monies and goods transferred between their families were bridewealth. Men appealed to the court for custody grounds that they had entered into a formal agreement to marry and had begun to give bridewealth to women’s families that legitimatized their rights over children66. Women appealed to the court for custody on the grounds that their “husbands” had not completed bridewealth payments, thereby rendering their relationship concubinage (ebone) in which women’s families retained rights over children. 47The case of Joseph N’Goua versus Marie-Thérèse Betoe is particularly illustrative of how malleable defining marriage, and therefore rights over children, could be in the varied levels of the native court system. Records of this lawsuit exist in both the registers of the conciliation court for the city of Libreville and second degree court. In August of 1956, N’Goua went before the conciliation of the city of Libreville requesting that the court annul a decision made by the customary court in the neighborhood of Atong-Abé67. The customary court forfeited him of custody of children born during his relationship to Marie-Thérèse Betoe. N’Goua argued that the customary court had superceded its mandate since the court did not have the power to decide upon filiation. He argued that he and Betoe had been legitimately married and demanded custody of the two children born during the marriage and the reimbursement of 4,500 francs he paid as bridewealth. Betoe countered that “she did not acknowledge that she had ever been Joseph’s wife; in consequence she unconditionally refuses to confer the children to him”. The suit made its way to the first degree court where the judge annulled the customary court’s decision. The judge ruled that N’Goua and Betoe had been married, recognizing N’Goua’s paternity, but did not order that Betoe return the children to him68. Upon N’Goua’s appeal of the decision, the secondary court acknowledged that paternal authority in Fang custom meant that N’Goua retained sole legal and physical custody of the children. The second degree court ordered them to be returned to his home. In other disputes over child custody, whether a divorce was the fault of the husband or wife, the second degree court ruled to attribute children to their father in instances in which they judged that a marriage had been legitimized by the transfer of bridewealth69. In following the custom that the flow of bridewealth determined child custody, the court divided the custody of individual children between their mother and father based on when bridewealth had been paid. For example, in the suit of Paul Bekale versus his wife Marie-Louise Condja, the second degree court determined that their first two children were born before they were legitimately married70. Condja was to retain custody of these two while the subsequent three children, born during their marriage, were to go to Bekale. 48Counter to the discourse of enforcing a rigid view of conjugal and sexual relations as determined by the commercial exchange of monetary bridewealth and “ownership” of women by men, native courts were not merely apparatuses of a colonial-patriarchy alliance. Conceding to women’s desires to leave undesired marriages, African judges allowed for divorce provided that the husband was duly compensated for his loss. Yet, in disputes over children, African courts ruled that the payment of bridewealth was a binding contract that inextricably bound children to their father’s lineages. Defining conjugal practice involved struggles to define masculinity as well as women’s roles. Conflicts erupted not only between husbands and wives, but also between men competing for rights and access to the same woman, thereby demonstrating the cracks in the patriarchal edifice. Status and generational tension between senior and junior men, men with ready access to cash and those without, created spaces for women to demand more fluid definitions of marriage in a period in which those in power sought to restrict their maneuverability. However, women were not mere pawns awarded to the winner in litigation, yet shaped their legal and conjugal status through strategic alliances with male kin and chosen lovers and through independent income. Allman, J. & Tashjian, V.
2000 I Will Not Eat Stone: a Women’s History of Colonial Asante (Portsmouth, NH: Heineman; Oxford: James Currey; Cape Town: D. Philip). 1923 “L’enfant dans la famille gabonaise”, Bulletin de la Société des recherches congolaises 3: 15-21. 2000 “Women, Marriage, Divorce, and the Emerging Colonial State in Abeokuta (Nigeria) 1892-1904”, in D. Hodgson & S. McCurdy (eds. ), “Wicked” Women and the Reconfiguration of Gender in Africa (Portsmouth, NH: Heineman): 27-46. 1997 Marriage in Maradi: Gender and Culture in a Hausa Society in Niger, 1900-1989 (Portsmouth, NH: Heineman). 1942 La nouvelle politique indigène pour l’Afrique équatoriale française (Alger, Office français d’édition. 2002 “‘The Woman in Question’: Marriage and Identity in the Colonial Courts of Modern Ghana, 1907-1954”, in J. Allman, S. Geiger & N. Muisi (eds. ), Women in African Colonial Histories (Bloomington: Indiana University Press): 116-142. 1938 « Essai de droit coutumier », in Écrits ethnographiques (Les pahouins du Gabon du xixe siècle à l’aube du xxe siècle, suivi de Essai de droit coutumier pahouin) (Libreville: Fondation Raponda-Walker). 2005 Litigants and Households: African Disputes and Colonial Courts in the French Soudan, 1895-1912 (Portsmouth, NH: Heinemann). 1999 “‘Changing Traditions to Meet Current Altering Traditions’: Customary Law, African Courts, and the Rejection of Codification in Kenya, 1930-60”, Journal of African History 40: 411-431. 2003 “Bridewealth and Female Consent: Marriage Disputes in African Courts in Guisiland, Kenya”, Journal of African History 44: 241-262. 1982 “Justice, Women, and the Social Order in Abercorn, Northeastern Rhodesia, 1897-1903”, in M. Jean Hay & M. Wright (eds. ), African Women and the Law: Historical Perspectives (Boston: Boston University): 33-50. 1 ANG (Archives nationales du Gabon), Register #91, Répertoires des collections de Registres divers, Tribunal indigène du 1er degré. Registres des Audiences publiques conciliation, commune de Libreville, Case #91, Bernard Koula versus Michel Ondo, April 9, 1956. 2 According to Fang customary law, “in the state of concubinage, the woman is free to make use of herself as she likes”. Letter #442, Chef p.i. du Département de l’Estuaire, Yves Saint-Alary to the Governor of Gabon, August 25, 1942. 3 In her research on marriage in colonial Niger, Barbara Cooper argues that most marital conflict in African families are settled in “local fora” and not in courts (Cooper 1997:18). 4 In early twentieth century Assante, Allman & Tashjian (2000: xxxviii) argue that women, “negotiated [a] shifting customary terrain at particular historical moments, by defending older formulations of custom in court or demanding new ones”. For other examples of this literature see: Wright (1982), Byfield (2000), Hawkins (2002), Shadle (1999, 2003), Roberts (1991, 2005). 6 At some point the governor wanted to have separate courts by ethnic group, but the attorney general warned against this, citing the revolts that occurred in Nigeria in 1925-28 when they tried to do the same thing. Governor General Bayardelle cautioned administrators to ensure that, “customary judges are frequently and attentively controlled”. ANG, Microfilm 51-MI-65-2, Bulletin de Renseignements politiques, septembre 1946. 7 CAOM (Centre des Archives d’Outre-Mer, Aix-en-Provence), aef/ggaef/5D56, Documentation sur le mariage africain en AEF, 10 juillet 1950. 8 In a letter to all the governors of FEA colonies Bayardelle suggested that divorces only be granted in cases of sterility, congenital malformation, incurable disease, brutal violence, and traditional unpardonable insults. Further dismissing the need to consult with native assessors, Bayardelle closed the letter asking the governors to respond right away to his recommendations, without the need to consult with “native collaborators”. CAOM, aef/ggaef/5D56, Circulaire du GG de l’AEF à Messieurs les Gouverneurs Chefs de Territoire, Libreville, Bangui, Fort-Lamy, et Brazzaville, 5 février 1946. 9 CAOM, aef/ggaef/5D56, Letter 391, Lettre du GG de l’AEF à Messieurs les Chefs des territoires Gabon, Moyen-Congo, Oubangui-Chari, 6 juillet 1948. 10 CAOM, aef/ggaef/5D56, Letter 391, Lettre du GG de l’AEF à Messieurs les Chefs des territoires Gabon, Moyen Congo, Oubangui-Chari, 6 juillet 1948. 11 CAOM, aef/ggaef/5D56, Circulaire du GG de l’AEF à Messieurs les Gouverneurs Chefs des territoires, Libreville, Bangui, Fort-Lamy, et Brazzaville, 5 février 1946. 12 ANG, 146, Letter 418, Lettre de l’Administrateur des Colonies, H. Tastevin, Chef de la circonscription de l’Estuaire à Monsieur le Chef de la subdivision de Libreville, 27 juin 1944. 13 The commander urged administrators to maintain a frequent presence in the halls where chiefs were presiding over conciliation cases since their presence would increase the authority of the chiefs in relation to litigants. In particular, the commander urged that administrators watch over and keep control over two African men identified as Corporal Guimbi and the interpreter Mathurin who often criticized decisions settled upon by the assessors. ANG, 146, Letter 418, lettre de l’Administrateur des Colonies, H. Tastevin, Chef de la circonscription de l’Estuaire à Monsieur le Chef de la subdivision de Libreville, 27 juin 1944. 14 In a 1939 political report, the head of the Estuary region complained about the number of palavers he had to deal with. Though colonial administrators directed people towards conciliation hearings, parties in disputes were constantly challenging the judgments of chiefs in conciliation court and coming to him to resolve. He argued that they need to reestablish a court with a European intermediary. ANG, Microfilm Reel 51-MI-75, Rapport politique du deuxième semestre de l’Estuaire 1939. 15 ANG, 164, Audience du 29 janvier 1943, doléances des Chefferies, communes et subdivision, 29 janvier 1943. 16 ANG, Register #112, Afrique équatoriale française, région de l’estuaire, Registre des jugements, Tribunal Coutumier, année 1950 du 4 novembre 1950 au 1er mai 1955. 17 The category of cases heard by year is as follows: 1950: 0 wife kidnapping, 3 adultery, 0 abandonment, 0 bridewealth, 0 levirate, 1 divorce, 0 compensation, 0 marriage agreement; 1951: 5 wife kidnapping, 7 adultery, 7 abandonment, 7 bridewealth, 3 levirate, 0 divorce, 1 compensation, 0 marriage agreement; 1952: 5 wife kidnapping, 4 adultery, 5 abandonment, 2 bridewealth, 2 levirate, 1 divorce, 1 compensation, 0 marriage agreement; 1953: 11 wife kidnapping, 4 adultery, 1 abandonment, 2 bridewealth, 1 levirate, 1 divorce, 0 compensation, 1 marriage agreement; 1954: 6 wife kidnapping, 9 adultery, 4 abandonment, 4 bridewealth, 2 levirate, 2 divorce, 2 compensation, 0 marriage agreement; 1955: 2 wife kidnapping, 0 adultery, 4 abandonment, 2 bridewealth, 0 levirate, 0 divorce, 0 compensation, 0 marriage agreement. ANG, Register #112, Registre des jugements, Tribunal Coutumier. 18 Even in these cases in which the husband came to court petitioning for a divorce and the reimbursement of bridewealth, husbands only did so because it was their wives who first asked for a divorce. These husbands had attempted to reconcile with their wives and the women refused. Women had absconded with other men or taken refuge at the home of kin. Husbands went to court more crucially in oder to seek reimburesement of bridewealth. See Case #3 December 1, 1950; Case #66 April 2, 1952; Case #20 November 26, 1953; Case #147 June 1, 1954; See Case #168 December 1, 1954. ANG, Register #112, Registre des jugements, Tribunal Coutumier. 19 See for example case #11 January 4, 1951; Case #23 February 2, 1951; Case #24 February 2, 1951; Case #28 May 15, 1951; Case #148 June 15, 1954. ANG, Register #112, Registre des jugements, Tribunal Coutumier. 20 Colonial administrators in other colonies also argued that women guilty of adultery should be directly punished with prison or fines, rather than fining her accomplice. An administrator in Congo wrote, “in my opinion sanctions must be the same for the wife as for her accomplice. To act differently would encourage prostitution, and to a certain extent, vagrancy since complicit husbands, and there is no lack of them, especially in laborer’s workshops, count on the systematic indulgence of the courts towards women to blackmail their wives’ lovers by threatening them with a suit in court”. CAOM, aef/ggaef/5D56, lettre du Chef du département de Pool (Congo) à Monsieur le GG, chargé de l’Adminstration du territoire du Moyen-Congo, référence: lettre #20 AP.2 du 5 février 1946 au sujet des divorces indigenes, 4 avril 1947. 21 Articles 336, 337, and 338 of the Penal Code allowed for a prison sentence of 3 months to two years, for the adulterous wife. In addition to the same term in prison, an accomplice could also be fined 100-2,000 francs. The only way that a husband could be convicted of adultery was if he had sexual relations with a woman who was not his wife in the conjugal home. ANG, 2686 lettre du Procureur général, Chef du service judicaire de l’AEF à Messieurs les Chefs du territoire du Gabon, du Moyen-Congo, de l’Oubangui-Chari et du Tchad, 26 juin 1946. 22 From 1939 to 1955, only three cases of the criminal prosecution of women for adultery appear in court registers. 23 CSSP, 2D60.2a4, Document #5, Projet de règlement des mariages entre Indigènes de race Fang, Article XI. 25 For examples, see Case #46 October 15, 1951; Case #63 March 15, 1952; Case #98 February 1, 1953; Case #129 January 15, 1954. ANG, Register #112, Registre des jugements, Tribunal Coutumier. 26 1950: Case #2 November 5; Case #5 December 2; Case #6 December 15. 1951: Case #10 January 4; Case #18 February 1; Case #25 February 2; Case #46 October 15; Case #47 October 16; Case #50 November 13. 1952: Case #63 March 15; Case #67 April 15; Case #70 Mai 31; Case #88 December 2. 1953: Case #90 January 5; Case #91 January 5; Case #98 February 1; Case #108 April 16; Case #108 April 16; Case #114 June 16. 1954: Case #129 January 15; Case #130 January 15; Case #133 February 3; Case #143 April 1; Case #145 May 1; Case #150 October 1; Case #161 October 15; Case #164 October 24; Case #169 December 1. ANG, Register #112, Registre des jugements, Tribunal Coutumier. 27 Case #133 February 3, 1954. ANG, Register #112, Registre des jugements, Tribunal Coutumier. 28 See Case #6 December 15, 1950; Case #63 March 15, 1952; Case #98 February 1, 1953; Case #145 May 1, 1954. ANG, Register #112, Registre des jugements, Tribunal Coutumier. 29 Case #91 January 5, 1953; Case #98; February 1, 1953; Case #108 April 16, 1953; Case #145 May 1, 1953. ANG, Register #112, Registre des jugements, Tribunal Coutumier. 30 See Case #5 December 2, 1950; Case #67 April 15, 1952; Case #161 October 15, 1954. ANG, Register #112, Registre des jugements, Tribunal Coutumier. 31 Men had extensive grounds for divorce: in case of a wife’s repeated adultery, inveterate laziness in carrying out work dictated by custom, incurable disease caught as a result of relations with someone other than her husband, witchcraft, and abortio (Mba 1938: 76-77). 32 CSSP, 2D60.2a4 Document #5, Projet de règlement des mariages entre indigènes de race fang, Article XIII, octobre 1942. 33 Specifically, a second or third wife could ask for a divorce for “serious and proven motives” such as the desire to marry a single man, if she had been married prior to puberty, and if she wanted to be baptized. The document defined “severe ill-treatment” of a wife by her husband as excessive, prolonged and unmotivated abandonment. Another justification for divorce was the case of spouses who were of different religions and when one spouse refused to allow the other to practice their religion. CSSP, Projet de règlement, Article XIII, Octobre 1942. 34 CAOM, aef/ggaef/5D56, lettre du Procureur général chef du service judicaire de l’AEF à Monsieur le Directeur des Affaires politiques, 31 janvier 1946; CAOM, aef/ggaef/5D56, lettre du Procureur du Tribunal de 1re Instance de Libreville à Monsieur le Chef du territoire du Gabon, lettre #494/APS du 29 juillet 1948 relative aux jugements rendus en 1947 en matière de mariage indigène, 30 juin 1948. 35 See Case #16 Janaury 15, 1951; Case #34 April 16, 1951. ANG, Register #112, Registre des jugements, Tribunal Coutumier. 36 Case #9 January 3, 1950; Case #16 January 19, 1950; Case #34 April 16 1951; Case #142 April 1, 1954. ANG, Register #112, Registre des jugements, Tribunal Coutumier. 37 For abandonment cases in which divorce was ruled see: Case #9 January 3, 1950; Case #16 January 19, 1950; Case #34 April 16 1951; Case #44 July 9, 1951; Case #57 January 9, 1952; Case #60 February 9, 1952; Case #64 April 2, 1952; Case #78 June 30, 1952; Case #92 January 15, 1953; Case #120 November 26, 1953; Case #134 January 15, 1954; Case #142 April 1, 1942; Case #152 October 1, 1954; Case #173 February 1, 1955; Case #176 February 23, 1955; Case #181 May 1, 1955. ANG, Register #112, Registre des jugements, Tribunal Coutumier. 38 As an exception, two rulings for divorce did detail that husbands directly sued their wives and made no mention of male relatives. In these cases, the wives themselves were directly charged with reimbursing bridewealth. See Case #173 February 1, 1955; Case #181 May 1, 1955. ANG, Register #112, Registre des jugements, Tribunal Coutumier. 39 Case #60 February 9, 1952. ANG, Register #112, Registre des jugements, Tribunal Coutumier. 40 Case #19 February 1, 1951. ANG, Register #112, Registre des jugements, Tribunal Coutumier. 41 In 1952, a man named Nzé Evore directly brought suit against his wife Eyang N’Guema, not her relatives, claiming that her desertion and request for divorce were based on “frivolous grounds”. The court ordered for her to return to the conjugal home. Perhaps the fact that there were no male relatives present to support her claim led to the court’s ruling. Case #82 October 16, 1952. For cases in which women were compelled to return providing that husbands pay wives’ families requested payments see: Case #32 April 16, 1951. ANG, Register #112, Registre des jugements, Tribunal Coutumier. 42 This option was recognized as a legitimate bargaining tool: “A father or one her relatives is authorized to retain the woman in cases of severe physical cruelty or insults inflicted upon her by her husband, and in the process of reconciliation, or also in order to oblige the husband to pay the remainder of bridewealth. The husband must submit to these demands if they are justified or well-founded” (Mba 1938: 76). 43 Case #32, April 1, 1951. ANG, Register #112, Registre des jugements, Tribunal Coutumier. 44 See also the case of Bivegue Biadong against his father in law Obiang Minko on the charge of his wife Mengue Bekale’s abandonment. Obiang Minko declared that he would allow her to return to him if he paid him 2,500 francs. The court ruled, “According to custom Bivegue Biadong must satisfy Obiang Minko the 2,500 francs and will take back his wife”. Case #178, April 15, 1955. ANG, Register #112, Registre des jugements, Tribunal Coutumier. 45 Case #94 January 15, 1953; Case #99 February 1, 1953; Case #141 March 22, 1954; Case #144 May 1, 1954; Case #175 February 15, 1955. ANG, Register #112, Registre des jugements, Tribunal Coutumier. 46 ANG, Register #107, Tribunal indigène de second degré du Département de l’Estuaire, statuant en matière de justice répressive directe, affaire N’Guema Mba, Rapt de femme, Case #36, May 10, 1949. 47 In 1951, 1952, and 1954, the court granted a divorce in 100% of the cases involving rapt de femme in which the wife insisted upon a divorce. However, in 1954, exceptions occurred in which the court ordered women to return to their husbands in fifty percent of the eight cases involving rapt de femme. Even if the lover had already remitted a bridewealth payment to the woman’s family, the court her kin to return the rival suitor’s bridewealth. This one year is the one exception to the general trend of customary courts to grant divorces in kidnapping cases in which the wife refused to return to her first husband or had already engaged in rapt one or two times before. ANG, Register #112, Registre des jugements, Tribunal Coutumier. 48 Case #9 January 1951; Case #37 May 15, 1951; Case #59 February 3, 1952, January 1953; Case #113 June 15, 1953; Case #114 June 16, 1953; Case #126 December 12, 1953; Case #128 March 16, 1954; Case #169 November 16, 1954. ANG, Register #112, Registre des jugements, Tribunal Coutumier. 49 See Case #45 October, 1951; #76 June 30, 1952; #83 December 2, 1952; #134 January 15, 1954. ANG, Register #112, Registre des jugements, Tribunal Coutumier. 50 See Case #13 January 16, 1951; Case #31 April 16, 1951; Case #42 July 9, 1951; Case #45 October 16, 1951; Case #69 May 31, 1952; Case #76 June 30, 1952; Case #83 December 2, 1952; Case #134 January 1954. ANG, Register #112, Registre des jugements, Tribunal Coutumier. 51 Case #134, January 15, 1954. ANG, Register #112, Registre des jugements, Tribunal Coutumier. 52 ANG, Register #106 Département de l’Estuaire, Tribunal indigène du second degré en matière répressive, civile et commerciale, 25 août 1939-Septembre 1941; Register #112, Département de l’Estuaire, Tribunal indigène, du second degré en matière répressive, civile et commerciale 1950-1956; Register #107, Département de l’Estuaire justice répressive indigène, Tribunal indigène du second degré 1944-1956; Register #116 Registre du tribunal des premier et second Degré, 1956-1966. 53 ANG, Register #107, Appeal #3, Toussaint Dowet-Pither versus Émilienne Gondjout, May 23, 1949. 54 ANG, 2DA(I)11, région de l’Estuaire, justice civile indigène, les affaires opposant les individus traitées au Tribunal du premier degré de la subdivision de Libreville, Jean-Baptiste Asse Bekale vs. Bekale Mba, 5 mai 1939. 55 ANG, lettre du Gouverneur général de l’Afrique équatoriale française à Monsieur le Chef du territoire du Gabon, Libreville, #116/APAG, 13 mars 1942. 56 Register #116, Registre du tribunal des premier et second degré, Memvie Memba versus Joseph Amvame, 16 juillet 1960. 57 Register #116, Registre du tribunal des premier et second degré, Augustin Mougangue versus Pauline Babina, 7 juin 1958. 58 In setting up concubinage, a suitor often agreed with the woman and a male representative from her family to give her a certain sum of money to provide for her. ANG, Register #112, Tribunal indigène du deuxième degré de l’Estuaire, Case #1, 10 octobre 1950, Pauline M’Atanga versus Antoine Figuereido. 59 See also the following cases in which the second degree court reversed decisions by the first degree court and judged that relationships were either formal engagements or marriages that entailed the reimbursement of goods or cash to the plaintiff: Vincent Waga versus Catherine Betoe, November 11, 1959; Maurice Ntoutoume versus Mlle Marie-Christine, October 31, 1959. Register #116, Registre du tribunal des premier et second degré. 60 The court assessed the wife and her family or lover an additional fee ranging from 3,000 to 10,000 francs in cases of abandonment or adultery. 61 ANG, Register #116, Registre du tribunal des premier et second degré, Jean-Francois Bekale versus Essone Ebone, November 22, 1957. 62 See the following for cases in which the court confirmed or increased bridewealth amounts and fines to be paid see: Engone-Emane versus André Bekang, January 1, 1958; Minko Messo versus Jérôme Mba, April 4, 1958; Georgette Youekeni versus Gilles Abeke, December 20, 1958; 1959: Joseph Tamba versus Mme Flonorine Mobonassi, November 28, 1959; Thomas NGoma-Nkoume versus Mme Hélène Gnigone, October 3, 1959; Joseph Tamba versus Mme Flonorine Mobossasi, November 28, 1959; Mme Micheline Obiang Oyame versus Grégoire Bekale, March 5, 1960; Jean-Désiré N’Dong versus Édouard Bekale N’Doutume, April 16, 1960; Joseph Mba versus Jean-Louis Moret, November 14, 1959. ANG, Register #116, Registre du tribunal des premier et second degré. 63ANG, Register #107, Tribunal indigène du second degré de Libreville, Case #1 Eyang Emane versus Philippe Mouloungui April 16, 1948. 64 A man could establish paternity and rights to his child if he did marry his lover and paid an additional fine to her family in order to claim paternity (Augagneur 1923: 17; Mba 1938: 88-89). 65 ANG, Register #107, Registre du tribunal des premier et second degré, Eyang Emane versus Philippe Mouloungui, April 16, 1948. 66 ANG, 2DA(I)11, Jean-Baptiste Asse Bekale versus Mba Bekale, May 19, 1939. 67 ANG, Register #91, Tribunal indigène de premier degré, Registres des audiences publiques conciliation, commune de Libreville, Joseph N’Goua versus Marie-Thérèse Betoe, August 6, 1956. 68 ANG, Register #116, région de l’Estuaire, district de Libreville, Régistre du Tribunal des premier degré et second degré, Joseph N’Goua versus Marie-Thérèse Betoe, December 7, 1956. 69 See the following suits: Paul Eman Richard versus Juliette Eto, January 4, 1957; El Hadj Mhamadou Bekale Ignace versus Louis Nang Obame, November 15, 1957; Paul Bekale versus Mme Bekale Marie-Louise Condja, January 1, 1958; N’Zé Mba versus Justin Bekale, April 11, 1959. ANG, Register #116, Registre du tribunal des premier et second degré. 70 ANG, Register #116, Paul Bekale versus Condja Marie-Louise Bekale, January 3, 1958. Department of History, University of Chicago, Chicago. Oxford, James Currey; Athens, Ohio University Press; Nairobi, East African Educational Publishers, 2005, 272 p.